Phase 1 of the Comber bypass opened in the 60’s. This is the section from the roundabout on the Newtownards Road to the roundabout on the Killinchy Road. Driving within the 50mph speed limit it takes 45 seconds to pass from end to end. Before it opened 10-15 minutes was the usual time taken for the same journey through the town centre. There is extensive landscaping and, by 2008, this photograph (looking towards Downpatrick) will probably be impossible from the same vantage point. J4669 : Road landscaping, Comber (1) shows a similar view in May 2012. Continue to J4569 : The Comber bypass (2). Phase 1 of the Comber bypass opened in the 60’s. Phase 2 opened in 2003. Both are built on the line of the old Belfast-Donaghadee railway. 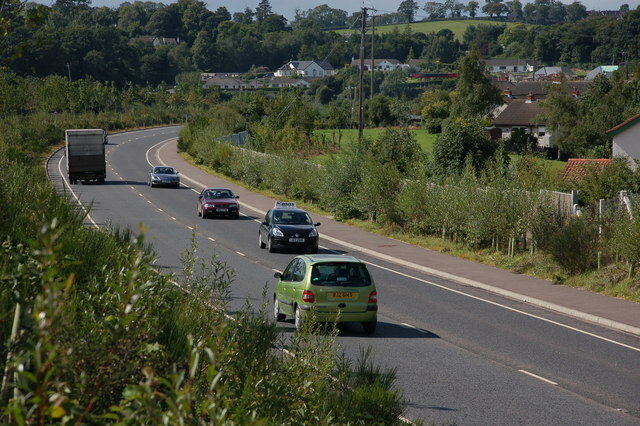 It connects the Belfast road to the roads to Killyleagh/Downpatrick and Newtownards. The Belfast and County Down Railway ran from Queen’s Quay station in Belfast to Castlewellan via Comber, Downpatrick and Newcastle. There were also lines from Comber to Donaghadee via Newtownards, Belfast to Bangor and branches from Ballynahinch Jct to Ballynahinch and Downpatrick to Ardglass. The lines opened between 1848 and 1892. All closed by 1950 except for Castlewellan – Newcastle which survived until 1955 as part of the GNR(I) route from Belfast via Banbridge and the Bangor line which remains open but from Belfast Central.